Albumen photograph of the mass grave from Wounded Knee, taken 1 January 1891, three days after the massacre on 29 December 1890. 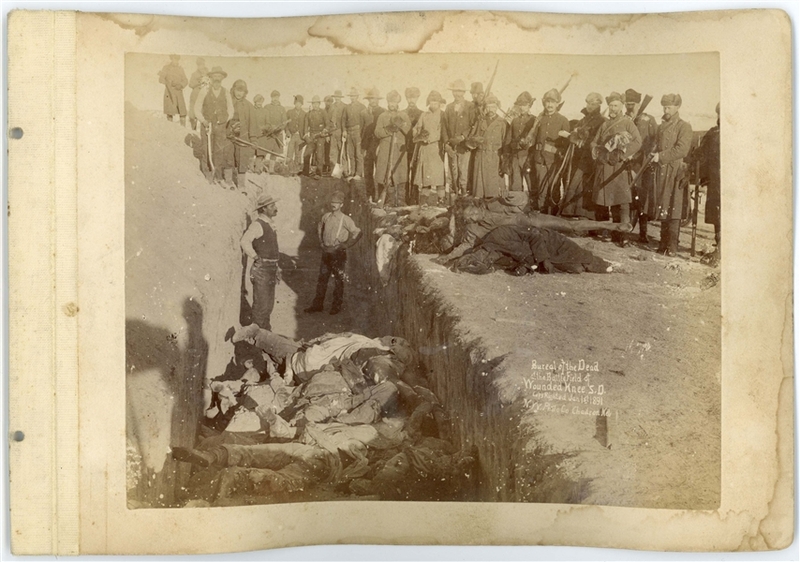 Photograph is captioned in the negative, "Bureal of the Dead at the BattleField of Wounded Knee S.D." 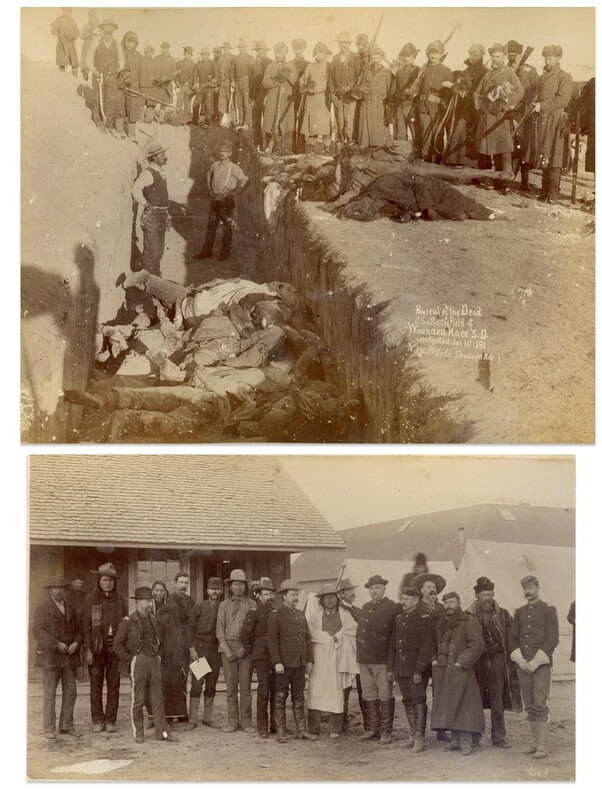 and published in "Eyewitness at Wounded Knee" where it stated that this mass grave "on the small hill where the Hotchkiss guns had been positioned" would ultimately contain 146 bodies. This photograph and another albumen were both taken by Northwestern Photo Co. of Chadron, Nebraska, whose company is well known for documenting the Wounded Knee massacre and its aftermath. 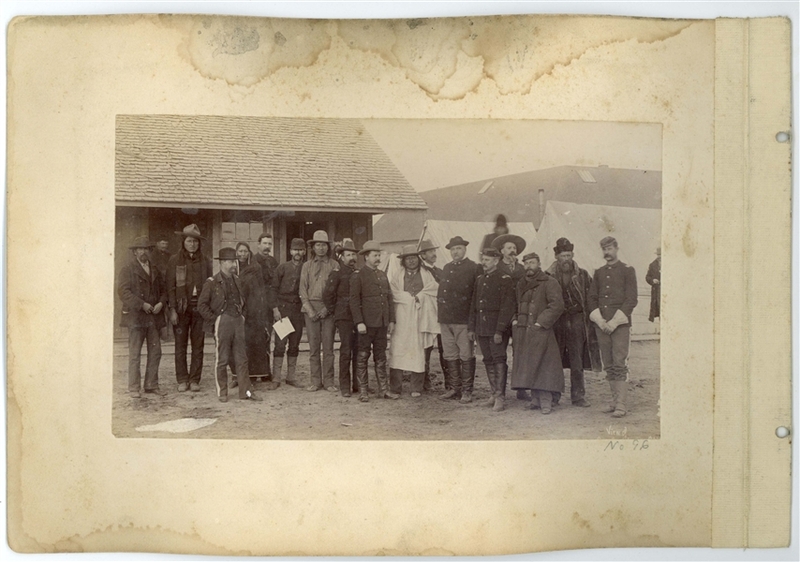 Photograph measures 7" x 4.25", affixed to mat where the other 7" x 4.25" photograph on verso, possibly unpublished, shows Buffalo Bill Cody standing alongside Lakota Sioux (possibly with Big Road at center) and U.S. officers. Mat measures 10" x 7". Some buckling, foxing and staining to mat. Small abrasion to bottom left of Buffalo Bill photo, overall very good condition.